Members of the Sleaford and District Royal British Legion are to join thousands on a pilgrimage to a First World War battlefield. The event culminates in a parade and ceremony in Ypres as part of the end of the First World War centenary commemorations this August. The event, known as Great Pilgrimage 90 (GP90) will be one of the largest in the charity’s history and marks 90 years since the original Royal British Legion Pilgrimage in 1928, which saw 11,000 veterans and war widows visit the battlefields of the Somme in France and Ypres in Belgium, a decade after the conflict. That Pilgrimage culminated in a march through Ypres to the Menin Gate Memorial in remembrance of those who never returned. Brian Harvey and Alan Robbins will represent the Sleaford community as standard bearer and wreath layer. They will tour battlefields and cemeteries, before marching through Ypres to the Menin Gate on August 8, joining more than 2,200 other representatives and dignitaries to lay a wreath bearing a unique, hand written message by Kirkby la Thorpe School pupil Alexandra Leeson, aged nine. 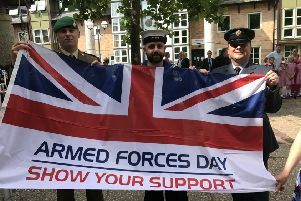 She won a logo competition at the recent Armed Forces Week.